One day a little girl came to visit and Tommy loved her right away, I don't know why. He just chose her for whatever reason. Tommy went over to her and put his head on her tummy and just stayed like that. They cuddled like that for about an hour, until finally the girl had to leave. When she tried to walk away he grabbed her sweatshirt and hung on to hit, not wanting to let her go. It was the only time that he forgot about showing off and just wanted to cuddle. 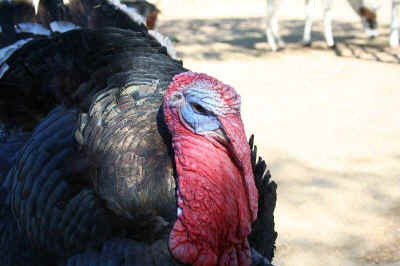 Twelve years ago a man approached The Gentle Barn and said that he purchased a turkey for thanksgiving and was planning to raise him and slaughter him for the holiday, but when it came time to do the deed, he could not do it. So he wanted us to take the turkey and give him a home. He warned us that he was very mean and aggressive and that I should always carry a rake with me so I could protect myself if he should strike. He also told me that he was as dumb as a box of rocks. I never had a turkey before so I believed the man and agreed that I would use caution. I named the turkey Tommy. That first night I told Tommy that he was safe at The Gentle Barn and I would take great care of him, always making sure he had plenty of good food, clean water and love. He listened intently and seemed harmless to me, but what did I know...this was my first turkey. The first night he was with me I showed Tommy where he would eat and sleep. He went into the room easily without protest and seemed to understand that I was helping him be comfortable for the night. The second night I remembered the man telling me that Tommy was not smart, so I went to find him to show him again where he would eat and sleep. I looked all over the barnyard and could not find him anywhere. Finally I found him standing in front of his door waiting for me to open it for him. Oops, maybe turkeys are not so dumb after all? For weeks I carried the rake around with me, feeling somewhat silly, in case Tommy wanted to attack me, and for weeks he would just watch me as if he was thinking, 'what is with the chick and the rake?" Finally I realized that he was not going to hurt me and I put down the rake. I had Tommy for two and a half years and he never, ever hurt me. Tommy was not a cuddly sort of guy, he preferred to show off and have folks admire him. He had little time to be pet as he was too busy showing off, although he did enjoy a good conversation and was an excellent listener. One time Tommy hurt himself and I had to clean his face and put medicine on it. It was near his eye and he had to stay very still, other wise it might get into his eye. I explained the situation to him and asked him to stay perfectly still. Tommy knew he had been hurt and knew that even though he was a tuff guy, he needed help from his mommy. Tommy did not move a hair (or rather a feather) and allowed me to clean his sore and put cream in it every day until it healed. Once it healed he went back to being a macho man, but I will never forget the time he allowed me to care for him. It has been years since Tommy passed away, but not a day goes by without me thinking of him and being grateful for what he taught me. Tommy taught me so much about turkeys and even more about stereotypes! Tommy was not at all who the man who gave him to us saw him as. Tommy was kind, smart and a gentleman. We love to put animals in boxes: "Dogs are loyal, cats are independent, pigs are dirty, cows are dumb, turkeys are stupid." But the truth is that we are all the same inside, we just look different. The only difference between the species is our perception of them! Thank you Tommy, you were a true gentleman! We love and miss you!